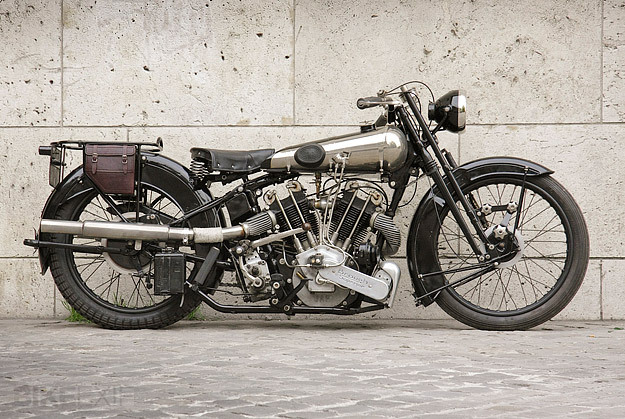 If you follow the classic motorcycling scene, you’ll know that the Brough Superior name has been revived by Austrian-based businessman and motorcycling enthusiast Mark Upham. These bikes are meticulous recreations of the originals, and built to the same Rolls-Royce quality standard as George Brough’s own machines. The ‘new’ engines are liter-class OHV V-twins—updated and refined versions of the J.A.P. racing engine used by George Brough in 1927. 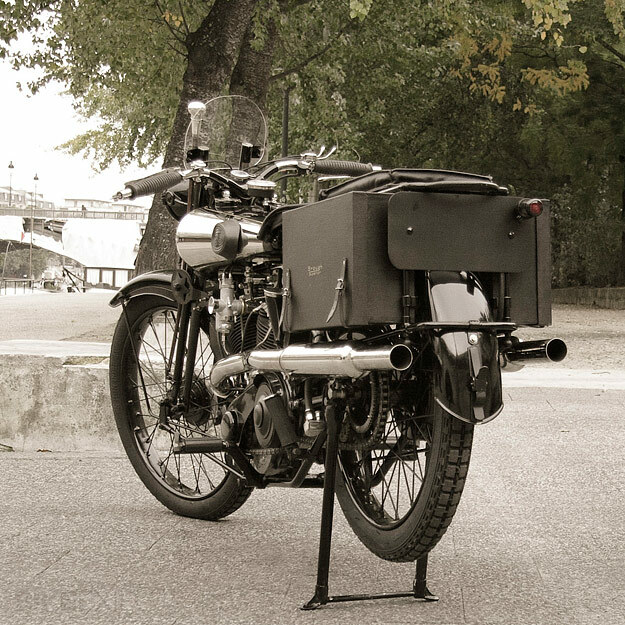 And finally, these new Broughs are slowly getting the photographic attention they deserve—as the Vincent Prat images below show. The four new Broughs were shot on the banks of the River Seine in October. The odd man out in this set is the bike with the heavily dropped ‘bars, in the image below. 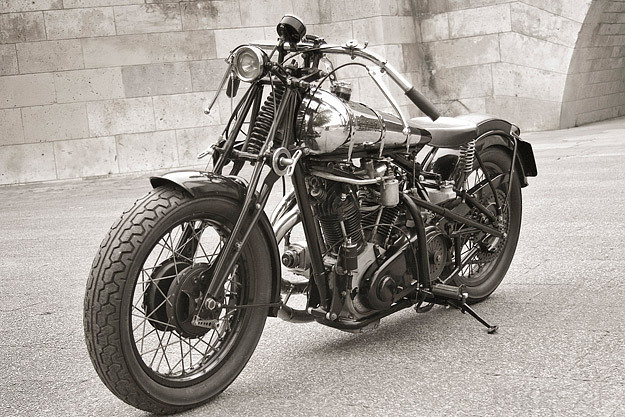 Known as the ‘Basil Brough’, it’s based on a 1928 model Superior. 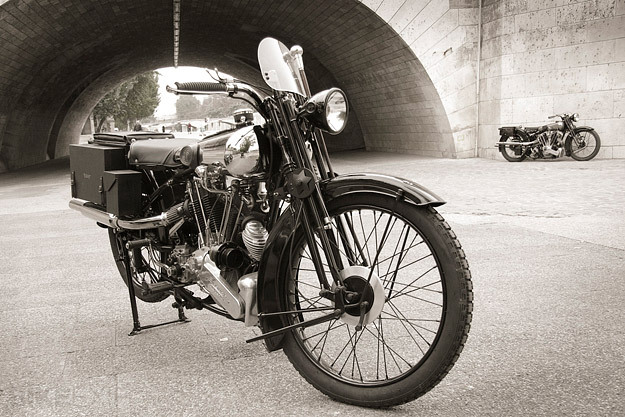 It was originally built by Chris Williams of Autocycle in the UK, a company that supplies useful spares for restoration. ‘Basil’ was built for sidecar racing, and runs on methanol. Mark Upham’s crew completely rebuilt the machine in 2008, to the extent of re-tubing the frame—which now has extra struts to handle the stresses of a ‘chair’. 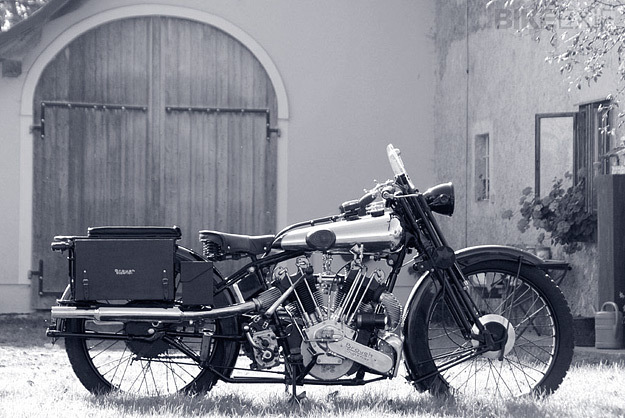 For more images and information about the bikes, check out the product pages on the Brough Superior website. I’m thinking of putting my name down for the bike in the final shot below, a ‘Pendalpine’ built in 2008 and based on the 1926 SS100. Thanks to Paul d’Orléans and Jared Zaugg. Images by Vincent Prat. Taken during a shoot by Nick Clements for Men’s File magazine.